Evaluating the implications of new technology features for mobile device management | Clarity Innovations, Inc. Thorough analysis and evaluation that identifies opportunities, informs market strategy, and makes recommendations that inform product development. 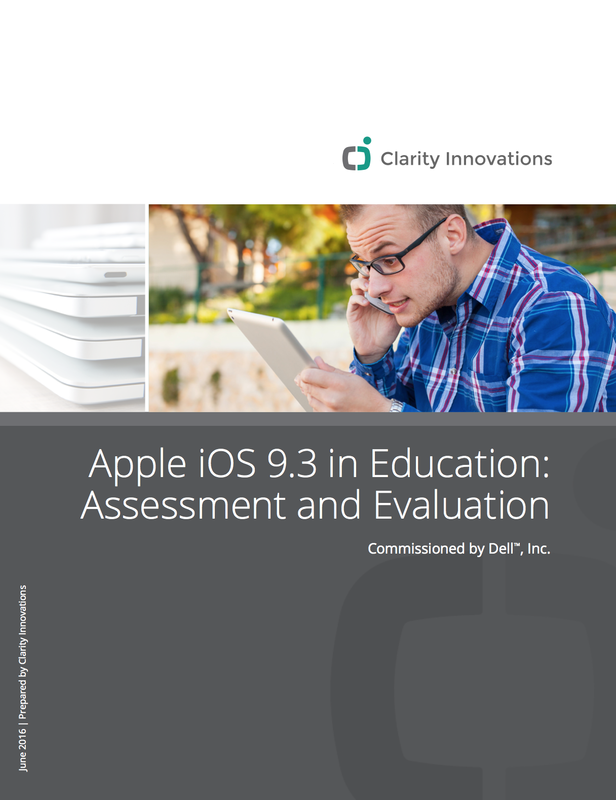 Apple's release of iOS 9.3 in March 2016 included a bundle of education-specific features in an attempt to address many of the challenging issues of managing iPad deployments in schools. Within weeks, more than half of all iOS devices in use were running it, the fastest adoption rate of a new operating system at the time. Our research investigated whether these education-specific features really make a difference. Without an environment for researching and testing the education-specific features of Apple's iOS version 9.3, Dell was unable to evaluate how these enhancements would compare to the Google Chromebook and Google Apps for Education ("GAFE") ecosystem which had become the largest market share of devices sold to schools in 2015 (source). Having heard about our work from another client, Dell realized Clarity Innovations had the knowhow, device testing environment, and grass-root connections with school district administrators and educators necessary to conduct an assessment of the new operating system and publish the results as a white paper. As a developer of several iOS apps, we already had advance access to iOS 9.3 and loaded it into a mix of iPads in our device testing lab. From there, we configured the devices as prescribed to take advantage of several of the new features including Apple Classroom, and compared several common workflows with other devices running older versions of iOS to identify efficiencies and tangible improvements that will help with classroom and device management. We also conducted several interviews with school district technology administrators and classroom educators to assess their experiences with the new operating system. The white paper summary of our evaluation and analysis was published in June 2016 and is available for free download.